MOBILITY MANAGEMENT is an innovative approach for managing and delivering coordinated transportation services to customers residing in Columbiana County, including older adults, people with disabilities, and individuals with lower incomes. 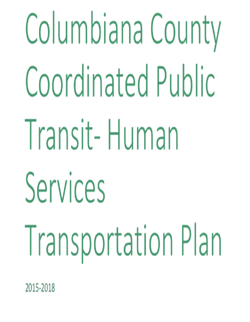 For more information about transportation in Columbiana County, review the Columbiana Coordinated Public Transit – Human Services Transportation Plan below. The MOBILITY MANAGER ROLE is to focus on meeting the various individual needs of the riding public and to be their advocate in creating a transportation solution to meet their need. This can happen through a wide range of transportation options and service providers or through coordinated efforts between them. The Mobility Manager also has a function in planning policy with service providers and transportation plan coordination for Columbiana County and builds local and regional partnerships to meet the current and future needs of the riding public. The Mobility Manager does NOT work for any specific transportation provider. They DO provide transportation planning, rider training, trip brokerage and coordination, safe-driver training, and the coordination of all transportation options within the county to better identify and serve the needs of the public and the county with specific attention to promoting accessibility, education and awareness to older adults, persons with disabilities, persons with low income, veterans and other underserved populations. What can our Mobility Manager do for you? Our Mobility Manager works for, and on behalf of, the riding public, and is here to help you with your transportation needs. Helps anyone who lives in Columbiana County understand and access the transportation options available in the county. Serves as an advocate for the riding public and a person to contact if you don’t know how to or can’t arrange transportation when and where you need or want to go. Provides rider training to the public one-on-one or in groups, and provides safe driver training to any driver of any provider in the county. Can assist in resolving any ongoing issues you have with transportation in the county, whether you are an individual, group, medical service provider office, work place or any other user of transportation, public or private, in the county. 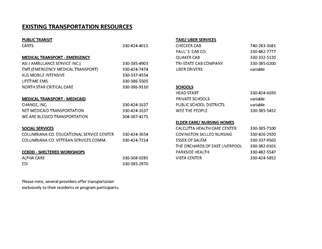 Click the icon to the right for a list of current transportation providers in Columbiana County and their contact information. The list is updated monthly, so please contact Deborah Hill directly if you know of any changes or additions that should be made. This week the featured news involves two exciting updates for Ohio involving (drum roll please): Hyper-loop trains! MORPC announced earlier this week a $2.5 million dollar transportation initiative to conduct a feasibility and environmental study on a proposed hyper-loop train that would stretch from Pittsburgh to Columbus to Chicago (with other potential stops along the way). Some areas that are supporting this study financially include areas we serve: The City of Columbus, Marysville and Lima, and Union County, to name a few. Please feel free to contact this office with any questions, concerns, needs or suggestions regarding transportation in Columbiana County. The office is generally open 8-4, M-F.
We try to answer any calls immediately, though there are times this is not possible due to meetings. You can always leave us a voice message and we will get back to you as quickly as possible. You can also email us or use the contact form below.